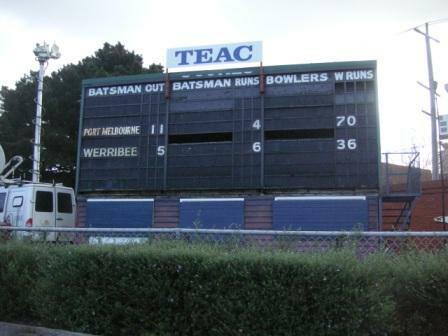 Peter Vesty is not sentimental about the old Port Melbourne scoreboard. 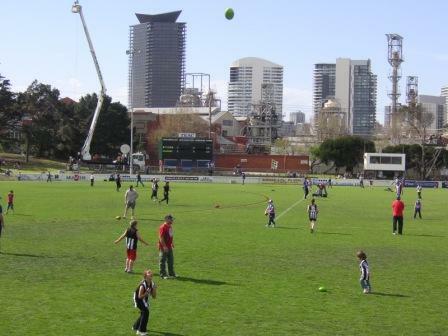 Peter reckons Port Melbourne’s North Port Oval should have an electronic scoreboard, like Frankston or Casey or Werribee. If there isn’t one at North Port next season, 2011 may well be Peter’s last season in the scoreboard, which was built as a cricket scoreboard at least 80 years ago. The backdrop to the scoreboard tells the tale of gentrification within a once-industrial suburb: high-rise apartments amidst chimneys and factory towers. 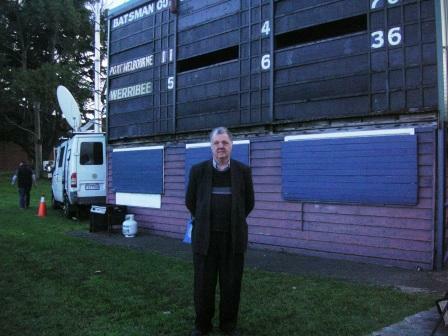 Peter grew up in nearby Ross Street and first started doing the Ingles Street scoreboard in 1964. 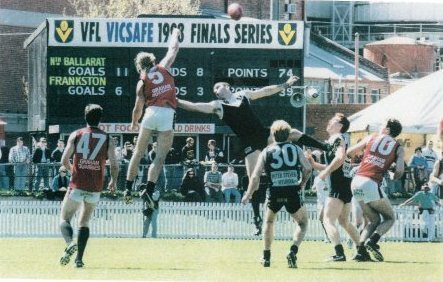 “I was about 20 and the kids doing the scoreboard always got it wrong, so I gave it a go.” That year Port Melbourne hosted a home grand final against arch-rivals Williamstown. “Port won 14.17 101 to 10.5 65,” says Peter as he gets up from his stool and hangs up another goal for the Borough’s reserves. After hanging up each score he records the details in blue or red pen in notepads on a makeshift shelf. Blue for points. Red for goals. 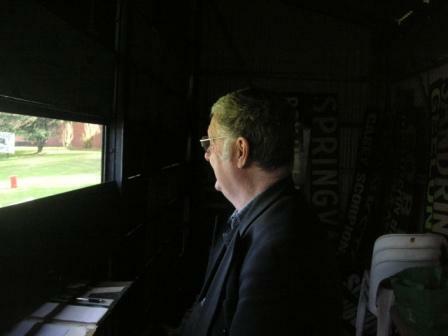 Peter returned to football duties in the early 1980s and it’s fair to say nothing had changed inside the scoreboard. “There’s just me and the spiders here. At the start of each season I’ve got to wipe away all the cobwebs. Port Melbourne is undefeated and top of the ladder in the VFL this season so Peter Vesty’s final games may well be victorious home finals. It would be a fitting end to a long and dedicated career. 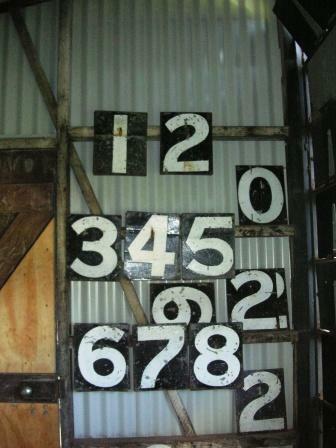 In the early 1940s Ron Bedford and his Evans Street schoolmate Percy Carter hung the numbers on another Port Melbourne scoreboard. “We had to cart a wooden box full of tin numbers from the Port changerooms to the other side of the ground, where the current scoreboard is,” recalled Ron, 83 years old (and no relation to Peter Bedford, former Port player and 1970 Brownlow Medallist). 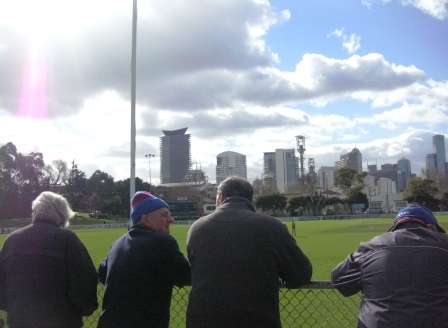 Port Melbourne Football Club was formed in 1874 and has won 15 premierships.